My father came ashore in the early 1950s, having spent almost 35 years at sea. He had taken up permanent employment in the coalfields of West Fife. Anyone coming to the region seeking employment in the Comrie Colliery would be offered one of the new council houses, being built to cope with the influx of families into the small village of Oakley, all part of a government resettlement plan. Finally mum would have a permanent home and a steady wage coming in, Seaman’s wages were not good and never guaranteed, paid when at sea, paid off when their boat docked, or in the case of wartime when your ship was torpedoed from under you. Bringing up children during the 1920s and 1930s had not been easy then came the war years, a task made double hard with her husband away at sea much of that time. Now her life would be more settled, with her husband home from work each day and hopefully taking on some of the responsibility for their growing family. For we her children, the blessing of a settled family life with dad now part of it and head of the household, however there was little doubt that mum would still remain ‘the boss’. 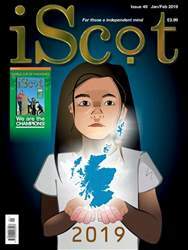 Issue 49 of award winning iScot Magazine is ready to download!